Tessa Longbons | February 13, 2018. Alabama’s annual abortion report for 2016 was published online by the state’s Department of Public Health in November 2017. The nine-page report reveals that abortions in the state have increased after a temporary drop the year before. *Information on Alabama’s abortion rate is not publicly available. In 2016, there were 6,642 abortions reported in Alabama, an increase of almost 13 percent from the year before, when 5,899 abortions were performed in the state (Figure 1). Abortions have fallen by almost 41 percent since 2005, the first year with information available. Alabama’s report does not explain the unusually small number of abortions in 2015, but it was potentially caused by the closure of the state’s highest-volume abortion clinic for part of that year. West Alabama Women’s Center, which consistently performs more abortions than any other facility in the state, shut down for a portion of 2015 due to a law requiring doctors at abortion clinics to have admitting privileges with nearby hospitals. The rule was eventually overturned. In 2016, West Alabama Women’s Center performed 50 percent of the abortions occurring in Alabama, and Planned Parenthood performed a little over 12 percent. However, the apparent drop in abortions in 2015 may also have been caused by underreporting. An illegal clinic was performing abortions in Selma, Alabama, during 2015, and it is impossible to determine how many abortions were not captured by the annual state report. More than 1,900 – 1,906, to be exact – chemical abortions were performed in Alabama in 2016. This represents a decline of six percent from 2012, the first year with chemical abortion data. However, chemical abortions composed 29 percent of total Alabama abortions in 2016 and only 22 percent of the total in 2012. 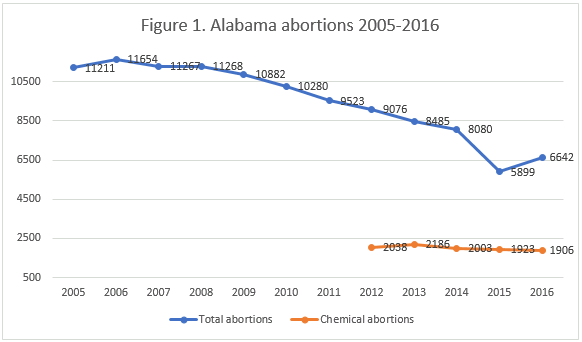 Chemical abortions were relatively unchanged from 2015, when 1,923 chemical abortions were performed in Alabama. Alabama does not report the state abortion rate. However, the Charlotte Lozier Institute estimates that the state rate increased from the year before (Figure 2). Alabama’s reports do not include the percentage of in-state abortions that were performed on state residents. It reports how many abortions were performed on state residents both in-state and out-of-state, but the report cautions that not all states share this information with Alabama, making the true total unknown. Most of the abortions occurring in Alabama were to women in their twenties. Thirty-three percent were ages 20 to 24, and 29 percent were 25 to 29. Twenty-three abortions were performed on girls aged 14 or younger, while seven abortions were performed on women who were 45 or older. Sixty-three percent of the women seeking abortion in the state were black, although African Americans make up only 31 percent of Alabama’s population of women of childbearing age. Alabama does not provide information on the education, marital status, and previous pregnancies of all the women undergoing abortions in the state. It does report that 51 percent of the Alabama residents seeking abortion both in Alabama and in other states had completed 13 or more years of education, and 90 percent of Alabama residents having abortions were unmarried. Thirty-seven percent of residents had had no previous live births, while 66 percent had never had an abortion before. Alabama measures the length of pregnancies ending in abortion using probable post-fertilization age (PPFA), which attempts to date the pregnancy from conception. PPFA is approximately two weeks less than gestational age, which is based on the woman’s last menstrual period. In 2016, some 56 percent of abortions in Alabama occurred at six weeks PPFA or earlier. PPFA was reported for all 6,642 abortions, and an ultrasound was used to make the determination of PPFA for all but three abortions. The state requires minors to receive parental consent before undergoing abortion except in cases of emergency. A total of 254 girls under the age of 18 received abortions in 2016. Of these, 252 girls received parental consent, and two obtained court orders bypassing the parental consent requirement. No emergency exceptions to the parental consent rule were reported. Alabama does not report on its informed consent process, and it does not provide information on complications resulting from abortion. Alabama prohibits abortions after 20 weeks post-fertilization (22 weeks gestation), when babies are capable of feeling pain, although exceptions are permitted when the life or physical health of the mother is at risk. If an abortion is performed after 20 weeks post-fertilization, the doctor must select the type of procedure based on what would give the unborn child the greatest chance of survival, unless that procedure would endanger the mother. In 2016, three abortions were performed after 20 weeks post-fertilization. In two cases, the women were suffering from uncontrolled obstetrical hemorrhages. In the third case, the mother was experiencing severe or life-threatening chorioamnionitis or sepsis. Two of the abortions were performed using the method that would most likely allow the baby to survive. For the third abortion, the doctor indicated that a different abortion method was used because of an obstetrical hemorrhage. Alabama’s report does not indicate whether any of the babies survived. A Charlotte Lozier Institute study on state abortion reporting placed Alabama at 12th best out of the 50 states, the District of Columbia, and New York City. Alabama reports information that many states do not, including Planned Parenthood’s market share and the reasons for late-term abortions. However, the state could improve its abortion reporting by adding information on complications and injuries resulting from abortion. Additionally, Alabama could include details on the education level, marital status, and previous pregnancies of all women seeking abortion in the state. Alabama does not report the state abortion rate. Rates were calculated by the Charlotte Lozier Institute using population estimates from the United States Census Bureau. 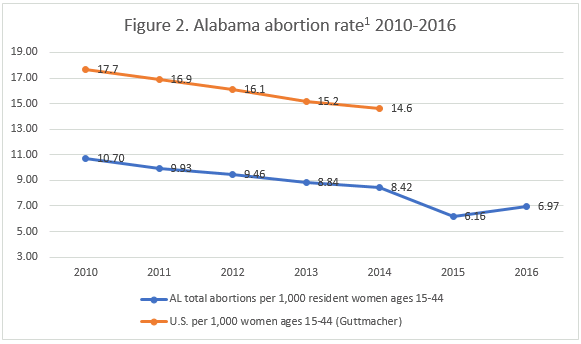 The rates were calculated using the following formula: (total number of abortions performed in Alabama ÷ number of resident women ages 15-44) x 1,000.